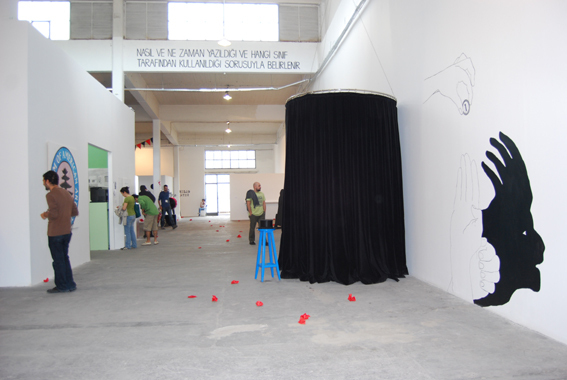 Exhibited: Firstdraft Gallery, Sydney, 2008, Istanbul Biennial, Turkey, 2009, Una selezione delle Bienali di Istanbul a Atene, Palazzo Valle, Catania, Sicily, 2010, in Forays. Systems of Self-Interest – Mechanisms of Looting, Kunstraum Lichtenberg, Berlin, 2012, Moon Workers, partnership between Museum of Contemporary Art of Santiago de Chile and the Academy of the Arts of the World, Colonge, 2014. 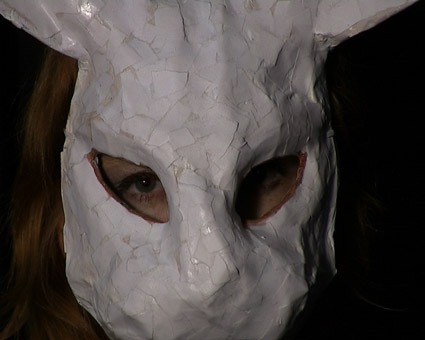 “Every performer, implies Zanny Begg’s 2008 video installation Treat (or Trick), relies to some extent on the complicity of their audience for the success of a given act, be it the distribution of the wealth or just pulling a rabbit out of a hat. It is an implicitly Brechtian conceit, an element underlined in the work’s inclusion in the forthcoming Istanbul Biennial, What Keeps Mankind Alive, themed, as it is, after the final song in the second act of Brecht’s Threepenny Opera. In a curatorial framework circulated in advance of the Biennial, What, How & for Whom (WHW), the four-woman, Zagreb-based curatorial collective behind the event, asserted that “bringing back Brecht is an attempt to think about the role of artistic endeavour in the conditions of contemporary capitalism, to re-evaluate our everyday practices, our value systems and modes of operation’; Brecht, they argued “invites us to rethink our position again and again”. This is very much the logic that seems to underpin Begg’s work, certainly Treat (or Trick) but also, and irreducibly, her entire practice as it sits within a general movement toward the visibility of the political in contemporary art” – Reuben Keehan, Of Beatial Acts and Rabbits in Hats, Broadsheet, Volume 38.3, Sep/Nov 2009. Treat (or trick) is a video installation in three parts exploring the tricks of the financial trade – Part one: The Magician, stars the notorious magician of the free market Mr Invisible Hands; Part 2: The Rabbit explores the secret life of rabbits (and other small commodities); and; Part 3: The Hat looks at the bottomless pit of our desires. Filmed and then projected inside the intimate space of a circular black curtain stage Treat (or trick) is a magic show with a difference. Canned laughter, boos, gasps and cheers evoke an absent audience who jolly along the solitary viewer in accepting some of the oldest myths of the free market. 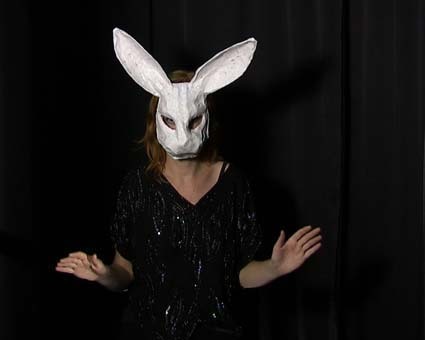 But as the film points out Mr Invisible Hands best trick is not pulling a rabbit from a hat, or acts of escapology and transposition, but in changing the relationship between audience and performer – no one really believes in the magic but we still come along to the show to see the “allure of the trick”. Using traditional side-show-music, including the danger riff played when an animal escapes from the circus, the video encourages an absurdist re-engagement with familiar arguments about the logic of money. 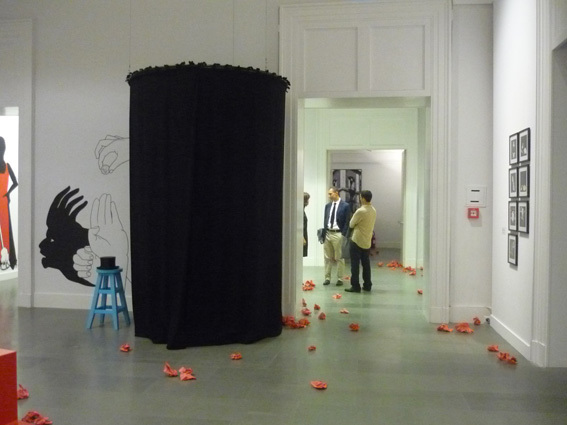 Installation shot, Istanbul Biennial, (right) 2009 and Una selezione delle Bienali di Istanbul a Atene, Palazzo Valle, Catania, Sicily, 2010.